Arriving by plane. The journey from the airport Leipzig-Halle to the city center takes approximately 30 minutes. There is a direct train connection run by the Deutsche Bahn AG travelling between the airport and Leipzig Central Station every half hour. Alternate possible airport destinations close to Leipzig include Berlin (two hours by train from Leipzig), Frankfurt am Main (three hours by train from Leipzig) and Hannover (three hours by train from Leipzig). Trains commute regularly between Leipzig and all three cities. Arriving by train. Using the Interregio- or Intercity trains you can travel to Leipzig from most European cities. Leipzig Central Station, one of the biggest and nicest in Germany, is located directly in the center of Leipzig. Arriving by car. You reach Leipzig on highway A9 (Berlin-Nürnberg) or A14 (Halle-Dresden). 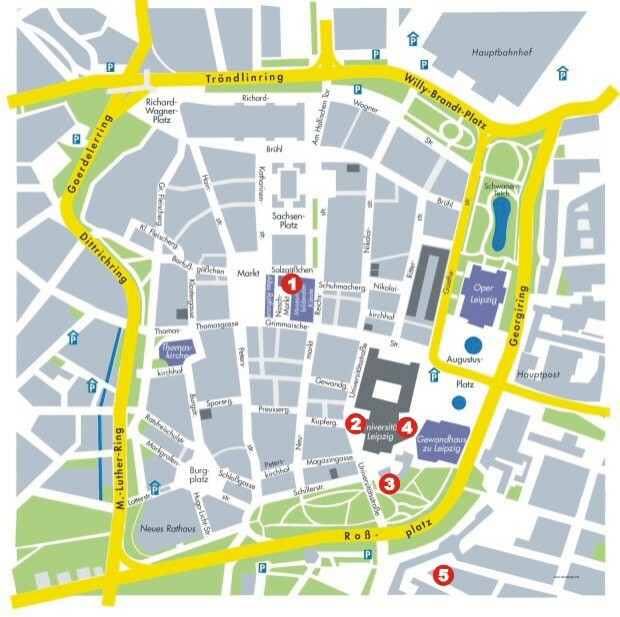 All events will be held in the center of Leipzig and are within walking distance of the railway station and the central hotels. Sunday. The opening evening (registration and Key note lecture 1) will be held at the “Alte Handelsbörse” (Naschmarkt – see map). Nearby you can find the restaurant “Mövenpick” (Naschmarkt 1–3), where a Welcome Party (including buffet dinner) will take place directly after the Key note lecture. Monday till Wednesday. 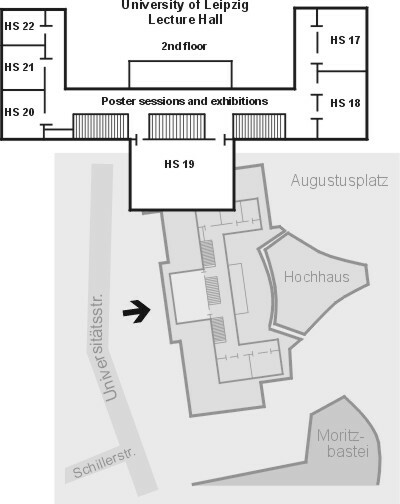 All symposia, thematic sessions and poster sessions will be held at the lecture hall (2nd floor) of the University of Leipzig (Universitätsstraße 7 – see map). There is a Get-Together Party on Tuesday (19:30) in the Panoramarestaurant at the top of the “City-Hochhaus” (Augustusplatz 9, see map). The cloakroom will be opened until 19:15 from Monday to Wednesday. On Sunday, registration is possible before the Key note lecture 1 between 16:30 and 18:00. Message board is close to the conference office. Conference staff can be identified by yellow name tags. Please, don’t hesitate to contact them for assistance. Confirmation of participation including the receipt and the abstract book will be with your conference material. You can download a PDF version of the abstract book (1.1 MB) from our website. Slide projector, overhead projector, and computer projector are available in each lecture room. Laptops will be provided for presentations only in urgent cases and upon request (often there are incompatibilities between operating systems, presentation software, fonts etc.). Please, arrange your schedule for EPIC so that you have time to organize the technical matters with your symposium/session chair at least 15–20 min before your symposium/session starts. Posters can be mounted starting on Monday at 12:00. They can remain until the end of the conference. Posters can be up to 130 cm (height) by 100 cm (width). Pins and scissors for final poster formatting will be available on site. Posters with odd numbering will be presented from 16:00–17:00 and posters with even numbering from 17:00–18:00 in order to avoid congestions in front of the posters.